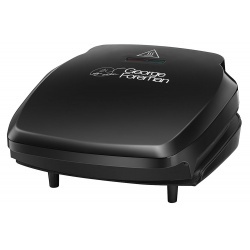 Effortless clean your grill with the George Foreman Sponge, which offers gentle but efficient cleaning. 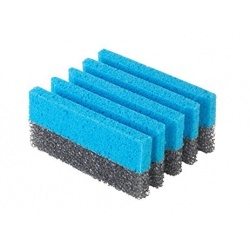 Specially designed for use with all George Foreman Grills, this Sponge features a unique shape that gets directly into the grooves of the grill for a great clean. This two sided George Foreman Sponge features a polyester cleaning sponge with a scouring pad which tackles burnt-on food while being gentle on your grill. Busy families can't live without this George Foreman 5-Portion Family Grill. Designed to cook up to 5 portions of food at the same time, this versatile George Foreman grill is a must-have for healthy households. The clever angled grill design aids up to 42% fat reduction during cooking, helping to channel away fat and grease into the separate drip tray. Whether you're cooking meat, veg or sandwiches, this grill couldn't be easier to use. Simply adjust the rear foot for flat angled cooking, or set the grill at an angle to get rid of excess fat. The clever floating hinge mechanism enables cooking of extra thick food, and it's much quicker than many conventional methods too! Stoes vertically saves room and can neatly be stored away. Love entertaining? The George Foreman Grill is the essential kitchen appliance. The sleek, black design will perfectly suit a modern kitchen and thanks to a spacious grill surface, you can cook up to seven portions at once – meaning your guests will never go hungry. A floating hinge enables you to cook extra thick food, including sausages and burgers, whilst the sloping grill channels fat and grease into a separate drip tray. The adjustable rear foot gives you more versatility when cooking. For sandwich and paninis, you can sit the grill flat preventing fillings spilling out. However, for meat, you can angle the grill to drain more fat from the product. A new, improved 3x longer last non-stick grill makes for easy cleaning and fuss-free cooking. Vertical Storage – including drip tray and cord storage, so you can keep work surfaces tidy and save space between uses. Variable temperature control – giving you more choice when experimenting with recipes. The benefits of cooking with a George Foreman Grill are so many and varied that it’s little wonder it remains the world’s leading brand in health grills – even 15 years after it was first launched. It’s easy to use, grills a whole host of food and can help you to cook up a healthier, tastier meal or snack in no time. The George Foreman 10 Portion Entertaining grill is ideal for larger families, entertaining your friends or even hosting an indoor BBQ – as we all know not to rely on the great Irish weather!! The 23440 Entertaining 10 Portion Grill has a cleverly designed floating hinge which accommodates extra thick cuts – so you can be generous with your slicing! With a floating hinge the grill top can move more freely, great for toasting sandwiches, paninis or more generous portions. The 970sq cm plate can cook up to 10 portions making it the perfect size to cook your favourite dishes for the family and friends. It is easy to use and the non-stick grill plates make cleaning a breeze. And an adjustable rear foot allows you to cook foods on an angle or you can set the grill flat to cook more delicate dishes such as fish or toasties. Fat reduction is at the core of the George Foreman brand and independent tests have shown that the George Foreman Grill removes up to 42% of fat* from food. The patented angled grill channels fat and grease away from foods, and contact grilling from both sides applies gentle pressure onto food encouraging additional fat to be removed. George Foreman is celebrating over 15 years as the leading health grill brand in the UK. These fabulous stand-alone grills are a favourite feature in millions of homes and are an easy, convenient and healthy way to whip up your favourite meals and snacks. From burgers to toasties and fish to pizza, a George Foreman Fat Reducing Grill delivers all of the taste and up to 42%* less of the fat. *Measured against 20% fat content beef burgers (113g). Impress your guests with delicious, vegetable kebabs or go Greek and grill up some lamb koftas. Large enough for up to seven portions, this George Foreman grill gives you versatility and simplicity when cooking a large family meal or hosting a dinner party. Variable temperature control – Allows you to choose how hot you want your grill, giving you more control over the cooking process. Adjustable rear foot – So you can change the angle of the grill. Tilt it to an angle so the fat and grease channels into the drip tray for healthier meals. Stand upright design – When you’ve finished using it, just stand it upright to save space on the counter or in a cupboard. Floating hinge – Designed so you can cook extra thick food more evenly. 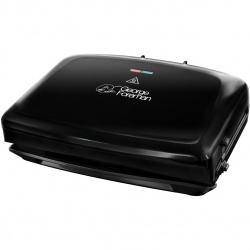 Offering unmatched versatility, the 10 portion grill and griddle offers an updated, contemporary design on the innovative George Foreman grill. 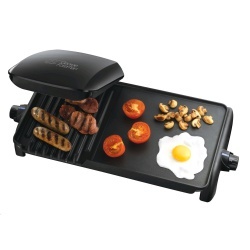 Perfect for amateurs and pro's alike, the grill and griddle allows any chef to juggle a variety of meals at once. Independent controls mean you can grill bacon, sausages and other options on the grill, while frying your egg on the griddle for the perfect full Irish breakfast. New and improved 3x longer lasting non-stick means that your grill will stay cleaner and fresher for longer. With a separate Perfect-fit drip tray, grease is channelled away from your food, creating a healthier meal and making washing up less of a challenge! Thanks to dual independent temperature controls you can tailor your temperature to suit whatever culinary creation your guests, family or friends desire. The floating hinge lets you cook extra thick food, so feel free to reach for those premium steaks on the supermarket shelves! Manufacturer's 3 year when registering online guarantee. 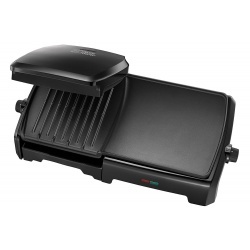 The George Foreman 10 Portion Entertaining grill is ideal for larger families or inside BBQs. It is easy to use and the non stick grill plates make cleaning a breeze. The floating hinge enables cooking of thicker cuts and the adjustable rear foot is perfect for flat grilling for fish, veg, paninis and more, in an instant. Fat reduction is at the core of the George Foreman brand and independent tests have shown that the George Foreman Grill removes up to 42% of fat* from food. The patented angled grill channels fat and grease away from foods, and contact grilling from both sides apply gentle pressure onto food encouraging additional fat to be removed.